It is our aim that the curriculum at Marshfield will provide highly positive, memorable experiences and rich opportunities for high quality learning; have a very positive impact on all pupils’ behaviour and safety; and contribute very well to pupils’ achievement and to their spiritual, moral, social and cultural development. Our Creative Curriculum is based on key skills and centred on our school and the needs of our learners. We have identified three key ‘Drivers’ of ‘Knowledge and Understanding of the World’, ‘Ambition’ and ‘The Creative Arts’ that are relevant to our school and our learners. These Drivers feed into every theme and are reviewed annually. Each class plans a theme or topic which covers the key skills and the content of the National Curriculum for their year groups, thus enabling a cross-curricular approach to teaching and learning. 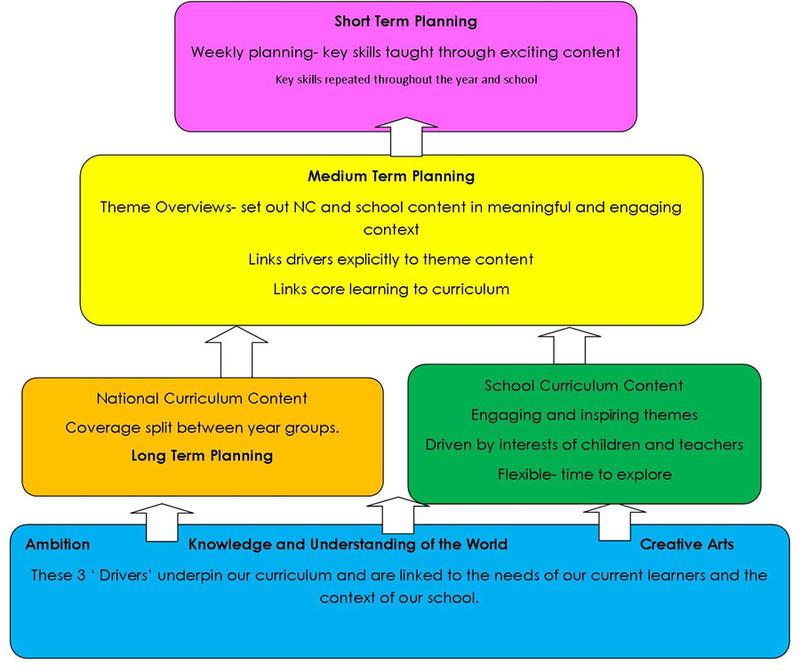 In order to ensure maximum coverage of the curriculum we plan four themes a year. In terms one and two they are Humanities based, in terms 3 &4 Science and DT based, in term 5 Literacy based and in term 6 Art based. Our children are taught all of the subjects of the National Curriculum. This provides them with a strong grounding in a full and balanced curriculum across all subjects from English, Maths and Science, to the range of foundation subjects. These include Art and Design, Computing, Design and Technology, RE, History, Geography, PE, , Music, Personal Social Health and Economic Education and Citizenship (PSHEE&C), Modern Foreign Languages, and Drama. The National Curriculum does not apply to pupils in the Foundation Stage. The curriculum for our youngest children is organised into seven areas of learning. These include: communication and language; physical development; personal, social and emotional development; literacy; maths; understanding the world and expressive arts and design. Below you will find an overview of how we deliver the curriculum across the school.